Can England Women create history on Indian Soil? So let’s find out. In Today Dream11 Fantasy Cricket Match Prediction of INDW vs ENGW 3rd ODI, we will cover who will win, expected playing 11, what astrology has to say on the toss, pitch report of Nagpur, Vidarbha Cricket Association Ground. We will also cover weather report, players recent and past performance, the best team for dream11, Guru prediction, key players, all news related to today’s match. The details we gather are from 100% reliable sources so make sure to read the whole post so that you don’t miss any information. All details in crix11 are absolutely FREE, you don’t have to pay a single penny to get these details. Date: The match will be played on 12th April 2018(Thursday). 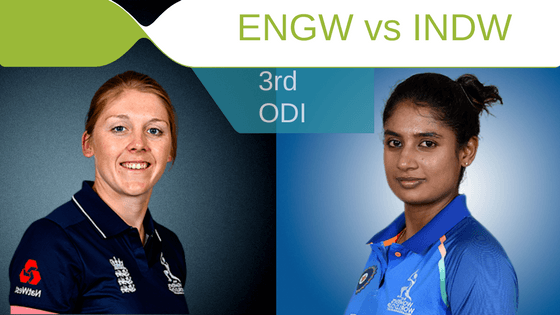 Match: England Women tour of India, 2018, IND-W v ENG-W, 3rd ODI. Highest total on this ground is 354/7 in 50 overs by IND v AUS. Lowest total on this ground is 113/10 in 37.2 overs by INDW v ENGW. Nagpur pitch is a batting pitch but in first two matches of England Women Tour of India 2018, spinners are doing wonders. The pitch will again support the spin bowlers. It will be interesting to see how ENGW and INDW handle the spin as both teams have quality spinners. If we look at last five encounters, both teams equals as a match out of 5 was abandoned. INDW has won two matches out of 5 games and ENGW has won 2 games out of 5 matches. It will be interesting to say which team makes 3 out of 5. According to our cricket expert, ENG-W has never won a bilateral series against IND-W in India. Before the play, isolated thunderstorms and scattered thunderstorms is expected but there is good news for the cricket fans and dream11 fantasy players as there is no rain expected during the match. The temperature will be 32-Degree Celsius, which may rise up to 37-Degree. England Women Tour of India will be broadcasted by Star Sports in India. Other Subcontinent like Nepal, Afghanistan, Bhutan, Sri Lanka, Pakistan, Maldives, and Bangladesh can watch the live coverage on the same channel (Star Sports). The live match of INDW vs ENGW 3rd ODI can be streamed on Hotstar Digital platform. Either you can decide to watch on their website or their App. Devika Vaidya, Mithali Raj (c), Rajeshwari Gayakwad, Harmanpreet Kaur, Sushma Verma (wk), Deepti Sharma, Shikha Pandey, Smriti Mandhana, Jhulan Goswami, Dayalan Hemalatha, Poonam Yadav, Veda Krishnamurthy, Ekta Bisht, Jemimah Rodrigues, Pooja Vastrakar. Heather Knight (c), Jenny Gunn, Tammy Beaumont, Bryony Smith, Amy Ellen Jones (wk), Georgia Elwiss, Fran Wilson, Katie George, Danielle Wyatt, Danielle Hazell, Natasha Farrant, Natalie Sciver, Alex Hartley, Alice Davidson Richards, Sophie Ecclestone, Anya Shrubsole, Kate Cross. Bisht, Poonam Yadav, and Deepti Sharma played an important role in the last two games and it is expected that they will continue with this form. After losing the first ODI ENGW bounced back in the second ODI. England Women has won the previous game with a ease. India hasn’t used their second seamer in the last game and it is most likely that India may bring back Jemimah Rodrigues. INDW may tweak their team as they have lost the previous game badly. Smriti Mandhana, Mithali Raj (c), Pooja Vastrakar/Rajeshwari Gayakwad, Devika Vaidya, Ekta Bisht, Poonam Yadav, Jhulan Goswami/Jemimah Rodrigues, Veda Krishnamurthy, Harmanpreet Kaur, Deepti Sharma, Sushma Verma (wk). Gunn will have to sit again as ENGW will play with three spinners. It is very likely that England Women will go with the same playing 11, until and unless there is fitness issue before the match. Our prediction is that they will play with same 11. Heather Knight (c), Tammy Beaumont, Fran Wilson, Sophie Ecclestone, Danielle Hazell, Georgia Elwiss, Anya Shrubsole, Natalie Sciver, Danielle Wyatt, Alex Hartley, Amy Ellen Jones (wk).